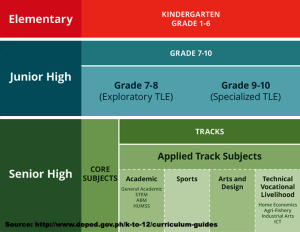 To improve the quality of education, the Department of Education (DepEd) decided to implement K-12 Curriculum. Meycauayan College, as one of the leading private schools in Meycauayan adopts the scheme to enhance MCians’ knowledge (MC Bamboo Editorial 2015). What are the Tracks and Strands of Senior High School? How will students choose their Senior High School Specializations? Students will undergo assessments to determine their strengths and interests. These will include an aptitude test, a career assessment exam, and an occupational interest inventory for high schools. Career advocacy activities will also be conducted to help guide students in choosing their specialization or track. Is SHS really necessary? Yes, according to the law. Beginning SY 2016-2017, after Grade 10, the student must go through Grades 11 and 12 to graduate from High School. Otherwise, he/she will be a Grade 10 completer, but not a high school graduate. Elementary graduates are those who finish Grade 6; high school graduates must have finished Grade 12. 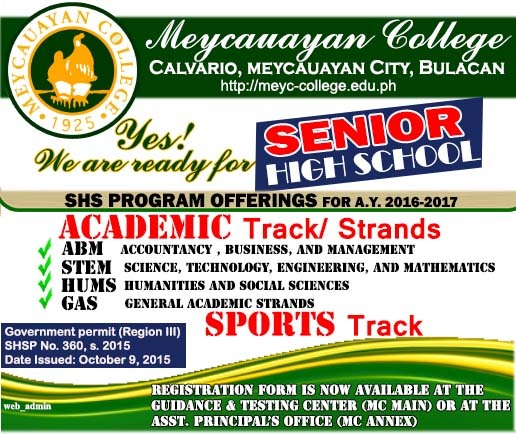 Is Meycauayan College ready for Senior High School?